Well it’s finally here! It’s Spring Fever Reveal day & I’m pretty excited to share what Kes & I’ve been slaving over working on! 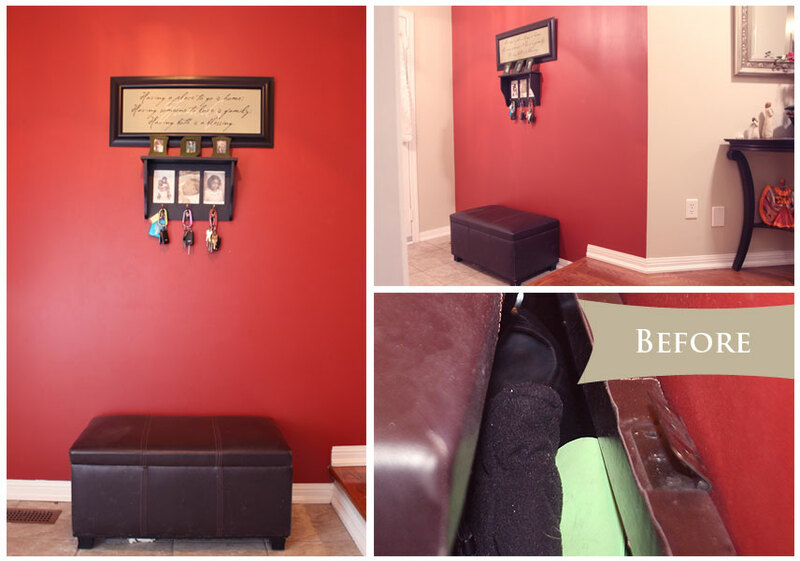 When I think of spring projects for the home, the first things that tend to come to mind are storage and organization. So when we were tasked with a ‘spring paint projects’ challenge, we wanted to find an area of the house where we could solve a problem while adding a bit of style. This was our first attempt at building a bench (and really our first at any real type of woodworking) and I honestly couldn’t be happier with how it turned out! We built the bench from 3/4″ pine veneer plywood & stained it using PARA TimberCare Solid Stain which we tinted in Runway (P5191-85D). Because we were trying to achieve such a dark colour we had to use a solid stain – but we watered it down slightly to allow a little more of the wood grain to show through. We then finished it off with PARA WoodCare urethane varnish to give it a nice glossy finish. 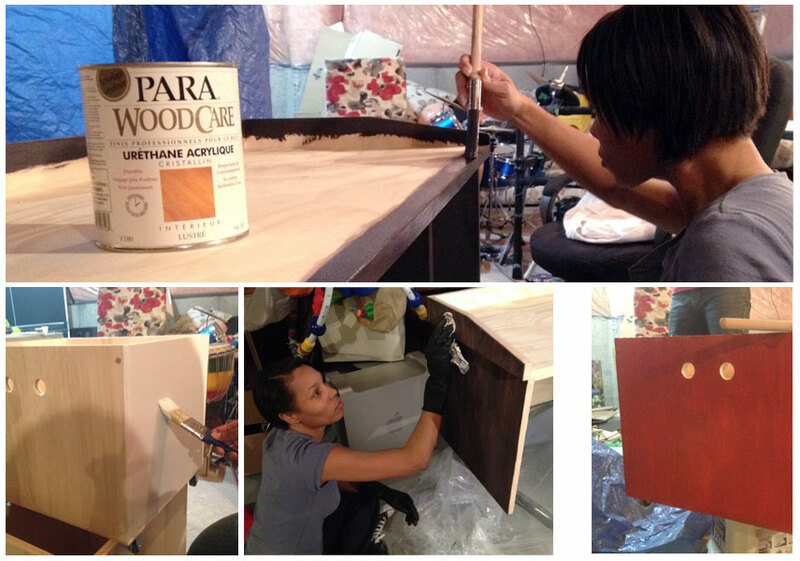 One of the best things about PARA’s TimberCare & WoodCare lines is that they’re water-based, which means no awful smell AND clean up is a breeze! The bench seat, we were able to up-cycle from a piece that Kes got from a coworker. We decided the faux alligator skin had to go & instead covered it using the beautiful Landsmere fabric in Current from Tonic Living. 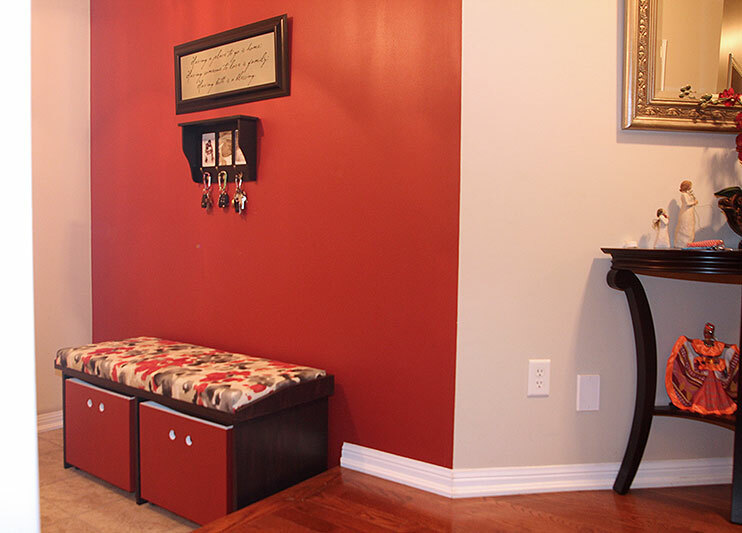 For the storage boxes, we opted to paint them in a rich brick red (Too Hot To Handle – P5078-85) to match the existing feature wall in the entry. There were a few hiccups here and there, and a couple moments of panic, but we made it through. I must send a special thank you to Kim of The Paint Store Plus Inc. our local PARA dealer for talking me off the staining ledge; as well as Janine of Tonic Living for going above and beyond to help us choose the perfect fabric for our project! I love how the fabric picks up the other colours in the house! So what do you think? Did we nail it?? Don’t forget – our PARA Blog Crew counterparts have been busy painting bees as well – so head on over to their blogs and check out their projects by clicking on the banners below! And once you’ve got your full dose of inspiration – be sure to come back & get in on the action by linking up a paint project of your own! 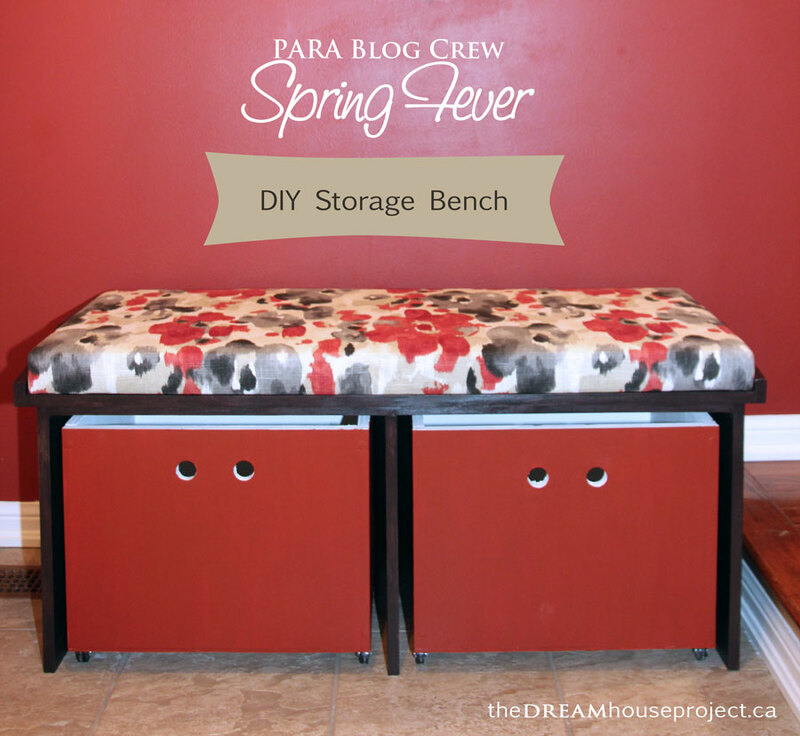 SPRING FEVER – Share your Spring paint projects! We ask that you only link projects that were created by you. You must link directly to a specific post. Do NOT link posts that are linked to your link party, shop or giveaway. Facebook, Pinterest, Google+ and other social media platforms. Lastly, PLEASE VISIT & COMMENT ON OTHER LINKS! Wow, you guys were ambitious! It turned out great. Thanks Mere! I think we surprised even ourselves a bit with what we were able to accomplish. And you totally should! An organized entry makes all the difference. And there are so many little things you can do to make a big impact fairly easily. Wow I love that bench! Let me tell you that does not look like no amateur bench! You guys did an amazing job. And that fabric. . . to die for! Thanks Sabrina! I know – I’m in love with the fabric too. Janine at Tonic Living is a godsend! I called her with our PARA swatch colour and she emailed me a few potentials to compliment it almost immediately. And I couldn’t be happier with it! Thanks Tash and Kester, the bench is amazing and I love the colours. You all are the best., As Kashee said this a.m. Wow, I love the drawers!!! LOL. Thanks so much! Gorgeous! I love that they are pretty functional! Thanks Jen! The function is probably my favourite part! Putting the storage boxes on casters just makes accessing the storage so easy! It looks great! You can never have too much storage – especially when it looks this good. Thanks Katie! Never too much is right. Especially at my parents’ house…between the 5 of us living there right now the number of shoes is out of hand! Lol! It’s nice to have an easy place to store them right by the door that keeps them out of the way. Love it – turned out great! Love that you made the drawers a different color! 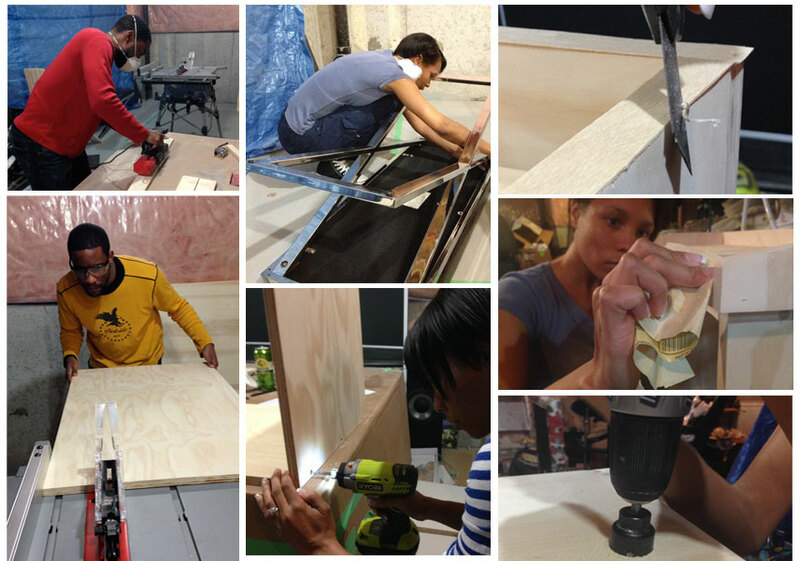 Look at you, painting and staining! I’ve never been that good with stain. It is definitely a skill I don’t possess. The bench looks fab. Good choice on the fabric too! 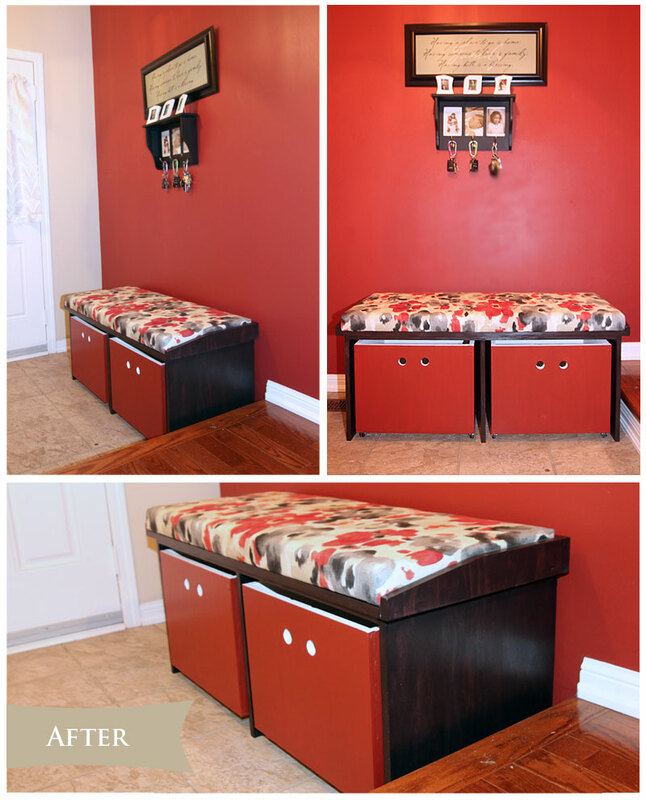 That bench turned out just beautiful and perfect for your entryway! Gorgeous! And I’m sure you will really enjoy all that storage! Thanks Dani! We definitely will. Having useable storage at the front door makes so much of a difference! WOW! you really transformed it! quite incredible! and I love the fabric you picked:) so pretty! Great project! 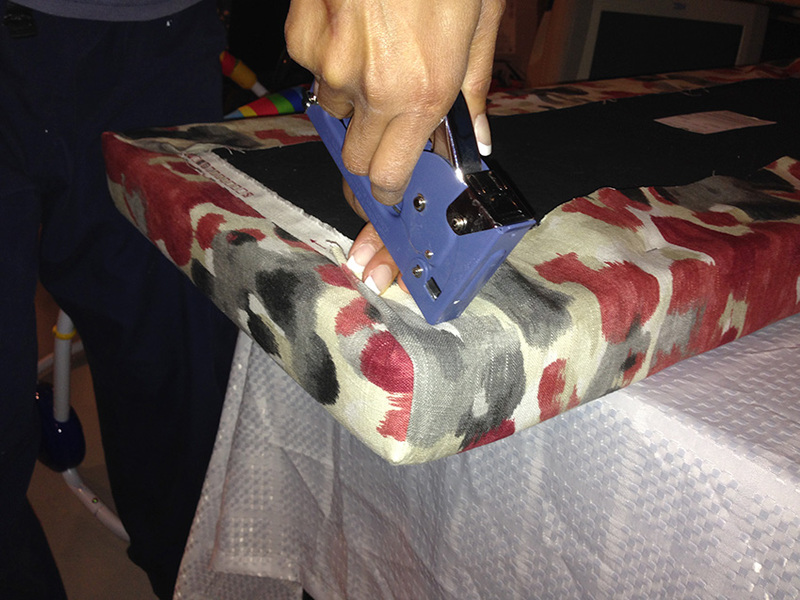 I love the fabric you chose and super smart to use the casters! Since you have this project down just right, how about you make one for me? hehe LOVE IT!! I love your new bench! You did a fab job on it. Great idea and I love the colour-fabric combo! Excellent work! Ok, seriously? Start making more of these and selling them immediately because it looks amazing! I don’t know anyone who wouldn’t love one of these in their entryway. Way to go, you guys. You never fail to impress!!! !